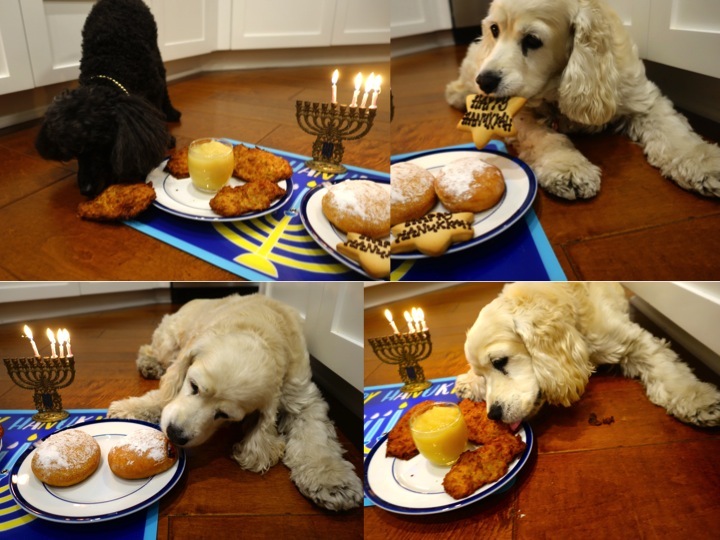 Hanukkah has amazingly yum traditions. Mommy served potato latkes, jelly donuts and cookies just for me and Annie. I dove straight into the delish potato latkes. Annie however wanted to taste it all! Hanukkah is such a fab holiday! Oh I wish you did live closer so we could have a Hanukkah party together! BearHUGs & RosyPoodleKisses! Yes, very yummy! And we are thankful for being so lucky as much as Mommy is thankful for her 2 little girls! BearHUGs & RosyPoodleKisses! Thanks Bond (I hope that is OK to call you, that is how Bear introduced us!) Hope you are having a wonderful holiday season! BearHUGs & RosyPoodleKisses! WoW Rosy sure looks like you guys got great Hanukkah treats! I love your menorah! Annie is adorable with the cookie coming out of her mouth. Happy Hanukkah! Thanks Tikka! Yes! Lots of Hanukkah treats! & of course I have to have my own size menorah! BearHUGs & RosyPoodleKisses! Annie's Gotcha Day #3 ! Snow in San Diego ? !